Louise Ritchie gained a fine art degree and post graduate diploma in drawing & painting from Duncan of Jordanstone College of Art & Design, Dundee. She has won several major awards including the Glasgow Art Club Fellowship, RGI (1998), the Scottish Art Club Award (1997), and the Millar Homes Paris Scholarship Citie Des Artes (1990). 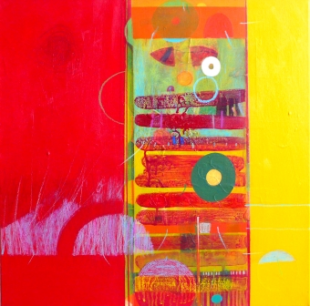 She has exhibited widely, including a solo show Land Light Vision at Glasgow?s Compass Gallery (1996), and at the London and Glasgow Art Fairs. Louise was also nominated for the Millar Homes Young Artist of the Year Award (1990 & 1991), and has work in several major collections including, the Mirror Group, London, Dundee District Council and Fife Regional Arts. She was elected to serve on the Council of the SSA, the Society of Scottish Artists in 1998, and has taught in academic institutions in Glasgow and Dundee. In 2006 Louise was invited to perform within the installation Killing Time, a collaboration between artist Graham Fagen and Suspect Cultures Graham Eatough at Dundee Contemporary Arts.